The new privileges allow an admin to approve new members being added to a group. The app now also allows users to add up to 50 group members to an ongoing video or voice call. The Facebook Messenger app has been updated with new features like admin privileges, joinable links and real time video, voice chat support within groups. The new features are aimed at improving the overall experience of group chats on Messenger. The company says that 2.5 million new groups were created on the app every day last year. 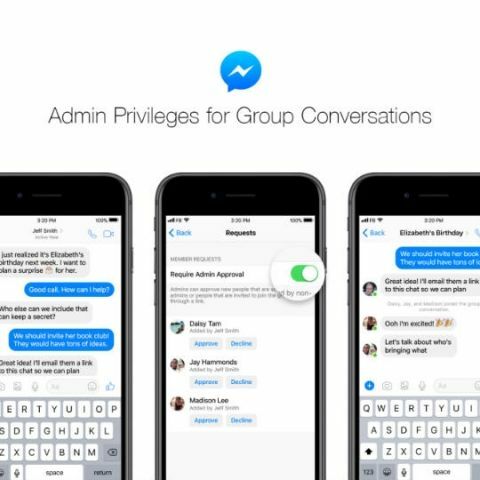 With the new privileges option, an admin will now have to give approval before any new members are added to a chat group on Messenger. The feature works in the background and is turned off by default. One can enable it from group chat settings. Additionally, admins now have the option of promoting or demoting any member to admin and remove members if needed. The Messenger app now supports real-time voice and video group chats with up to 50 members at once. Group members can also be added to a video/voice chat, without the need for disconnecting the conversation. Links for joining a group have been a part of Facebook’s WhatsApp from a while now and the same is now available on Messenger. Any users in a group can now invite people to their groups by sending joinable links and the receiver will automatically be added to the group in case the approvals are off, or else after the admin’s approval. Facebook recently announced the video chat feature for Facebook Lite, a scaled down version of its app. The company said that users can tap on the video icon on the upper right corner in a conversation screen to start a video chat on the Facebook Lite app and they will be able to switch from an ongoing voice call to video as well.